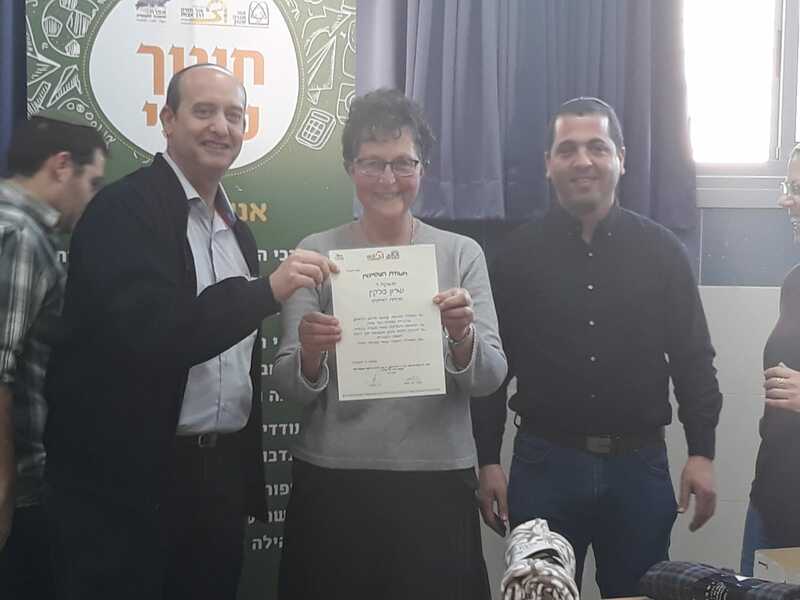 Sharon Belkin receives her certificate of excellence from OTS Derech Avot principal Rabbi Yoni Hollander, left, and project coordinator Avichai Foa. Among the myriads of high school students who received their end-of-term report cards this week, there is one unique class comprised of students in the seventh and eighth decade of their lives. 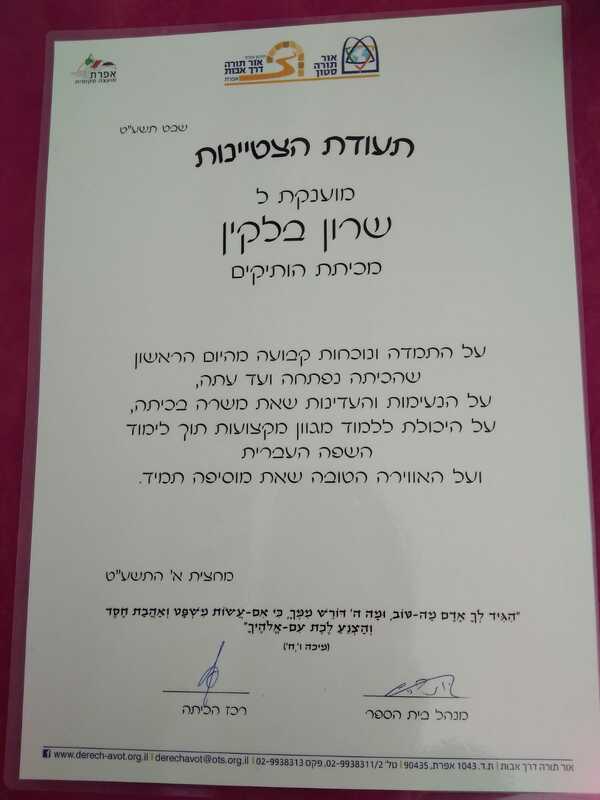 This is the fifth year that Ohr Torah’s Derech Avot high school is marking the end of the school term with a certificate award ceremony for excelling students along with the school’s class for senior adults class. Among those who received certificates of excellence was Sharon Belkin, aged 66, a student in the senior adults’ class. The certificate presented to Belkin bore the following words: “This certificate of excellence is hereby awarded to you for your perseverance and full-time attendance from the very first day the class opened until this day; for the gentleness and pleasantness you bring into the classroom; for your ability to study a variety of subjects while learning Hebrew at the same time; and for the positive atmosphere you create wherever you go.” Following the ceremony, the 10th graders and the seniors convened for a joint activity and a moving inter-generational discussion and learning session. The senior adults’ class in Ohr Torah’s Derech Avot high school comprises 25-odd students, all of whom are retirees aged 65 – 80, and was launched about five years ago as part of an initiative spearheaded by the Ministry for Senior Citizens (as it was called then) and its minister, the late Uri Orbach of blessed memory, in cooperation with the Ministry for Social Equality and the local council of Efrat. 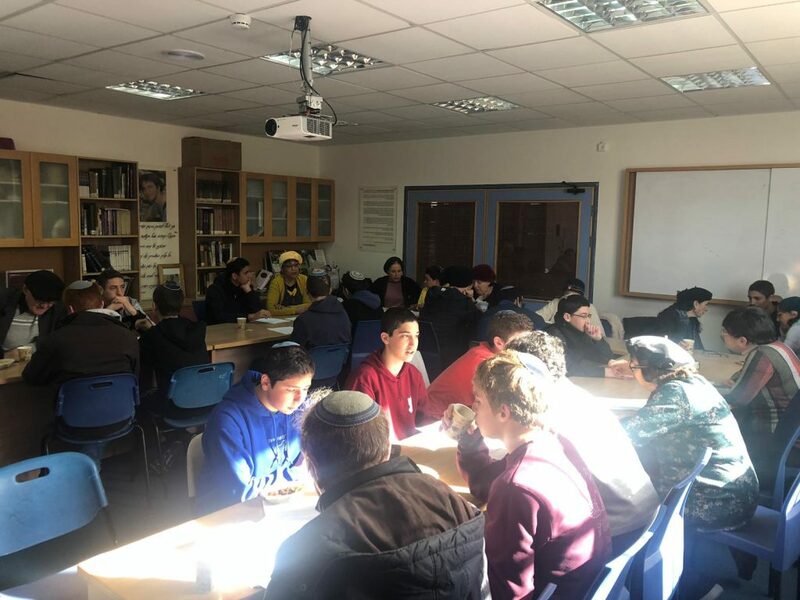 Ever since, the students arrive at the high school twice a week for a packed day of learning which includes a variety of subjects: History, Arabic, Art, Biology, Talmud, Cinema etc. They also participate in the annual school activity and ceremonies cycle. The senior adults’ class is traditionally “adopted” by the tenth graders studying with Rabbi Weinstein and hold joint meetings once a month. These encounters present a unique opportunity for inter-generational bonding and cross-age learning. 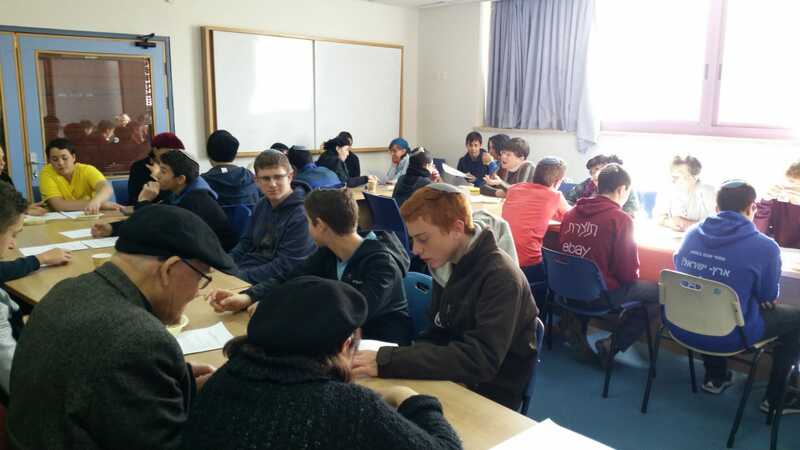 Ohr Torah Stone’s Derech Avot high school is a religious public school which promotes heterogeneity and aspires to cater to all the students of Efrat and Gush Etzion who wish to study in a religious public day-framework. The aim is to integrate a broad range of students, both in terms of learning capabilities as well as religious affiliation, from the entire region.